Richard Walker's Blog: Adam and Eve, Christ and the Church, Heaven and Earth and the Prepositions which Connect them all. 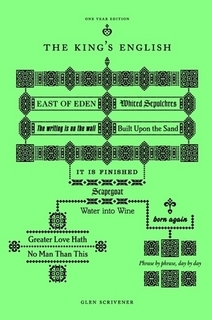 Adam and Eve, Christ and the Church, Heaven and Earth and the Prepositions which Connect them all. I've started reading through a devotional book by Glen Scrivener called the King's English. (View it for free here. Buy the paper-based editions here.) He wrote it to commemorate 400yrs of the King James Bible. Each day he takes a (usually) well-known phrase from that translation of the Bible and comments on it. It is EXCELLENT and I HIGHLY recommend it. There are three prominent prepositions used about Adam and Eve in Genesis 2. For, From, and To. She is for him. From him. Then brought to him. This movement we see in Adam and Eve is not only the paradigm for understanding how Christ will be united to his church, nor is it only a picture of how the Trinity are united eternally. It is also a picture of how Christ is united (albeit to a lesser degree) with the whole creation. The rhythm of God is a "going out and a coming back again," or a "scattering and gathering," (Ec.3:5), but the return is more glorious than the departure. By the will of the Father and in the power of the Spirit, Christ creates all things (going out), then redeems and unites himself to all things (coming back). This is supremely seen in his relationship to the Church, but it doesn't end there. The Christian hope is not that we leave earth and "go to Heaven," but that the whole creation will be saved / transformed / glorified too. Just as Adam and Eve were united as one flesh, so too, our little earth (feminine noun in Hebrew) will one day be united with God's Heaven (masculine noun in Hebrew) and the two will be finally One, (Rev.21:3). For more on that thought, click here. What we see now by faith, one day we will see in front of us.